Blues lost valley Replay By Jumper: 16 ms tires. This one is mostly about speed control. Pay particular attention at speed wile taking the curves on that wood bridge at start and alsowhen jumping under both covered bridges. There also a major short cut. 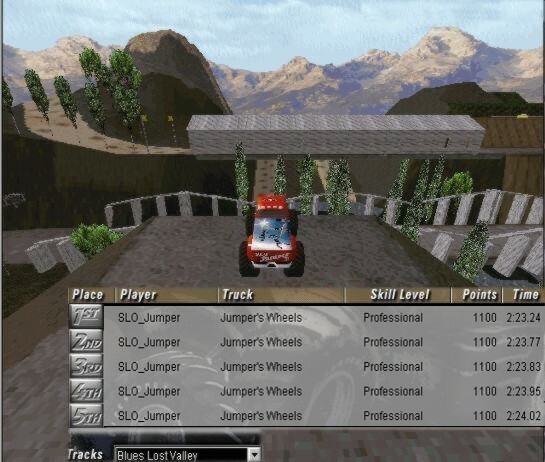 Blues lost valley Replay By Jumper: 17 ms tires. Thx to MonkeyB for pointing this cut. This shortcut appeared indeed to be possibly faster than the other one but this one is extremely difficult to re do with a fair consistency. So if you're looking for fast lap running by yourself go for it. If you're going out to race with others i suggest you use the othe cut shown above. The 3rd lap of this 3 laps replay shows a lucky lap in 2:23:24. It's more a matter of luck and patience then talent.